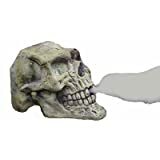 Ground Fogger This 1000 watt fogger will add an spooky feeling to your haunted house! Comes with complete instructions. Fog Filled Bubble Machine includes machine, 1/2 pint Bubble Juice and 1/2 pint Fog Juice. UL Listed. Large Copper Cauldron & Mini-fogger Our Large Copper Cauldron & Mini-fogger add real Halloween atmosphere. Crafted from Anatolian copper, the Cauldron is an authentic, handmade reproduction of an antique original. Place our Multicolor Fogger inside the Cauldron, add water, and watch a magical mist appear. With nine multicolor LED lights, the fog appears as a rainbow of colors. Uses ultrasound technology to generate fog with no chemicals. 19" - 21" diameter. Foggy Halloween Cauldron This Foggy Halloween Cauldron uses no chemicals, so requires no muss or fuss — even Frankenstein could do it. Instead, our Cauldron uses tap water and plugs into a standard outlet. All you have to do is stand back and enjoy the appropriate eerie effects. Includes fogger and glowing lights. 17" diameter, 17"H.
Commercial Fogger Just plug in the compact Commercial Fogger into any standard outlet, add the fog fluid (not included), and prepare to scare. It's programmable, and is great for all room sizes. Uses a completely safe, water-based fog fluid available at most party supply stores. Our Fogger Bubble Machine brings mystery and whimsy to your next Halloween party. This 200-watt machine produces bubbles that release a puff of fog when they burst. • Overall Dimensions: 14x14x14 "
Toxic Waste Fogger Measures approximately 8" high x 6" wide and comes with a UL approved adapter, a mist deflector, a plastic liner, a plastic mat. Coffin Fogger Coffin Fogger measures approximately 6" high x 9.25" wide x 5.5" deep and is made of resin and plastic and includes the fogger and lights. Fogger uses regular tap water. Grim Reaper Fogger Grim Reaper Fogger has a tombstone-like shape with the Grim's face on the backboard with the hands holding a stone bowl that contains the fogger unit (uses regular tap water). Measures approximately 14" high and is made of resin and plastic. 400 watt fogger This 400 watt fogger will create the perfect spooky scene in any room! Comes with complete instructions. Includes UL Listed AC adapter with on/off switch and 6' long power cord. For indoor use only. 9.5" Sinister Pumpkin Fogger 9.5" Sinister Pumpkin Fogger uses regular tap water and is made of thick, sturdy plastic. Includes UL Listed AC Adapter with on/off switch and Power Cord. Includes plastic mat to place under unit. Fogger Unit includes mini-lights that change colors. For indoor use only. Fog rolls out of the eyes, nose and evil grin. Adult Supervision is required. Sinister Pumpkin Fogger Pumpkin Fogger measures approximately 10" tall. Uses regular tap water. Made of thick, sturdy plastic. Includes UL approved AC adapter with 6' long power cord. Includes plastic mat to place under unit. Fog / Mist Maker Unit Fog Maker Unit comes with complete instructions and UL Listed AC Adapter with 6' long power cord. Unit creates fog with ordinary tap water.